Today was more of the same as yesterday with Brianna and I walking the strip during the day and touring some interesting casinos, but our evening and night was entertainment. 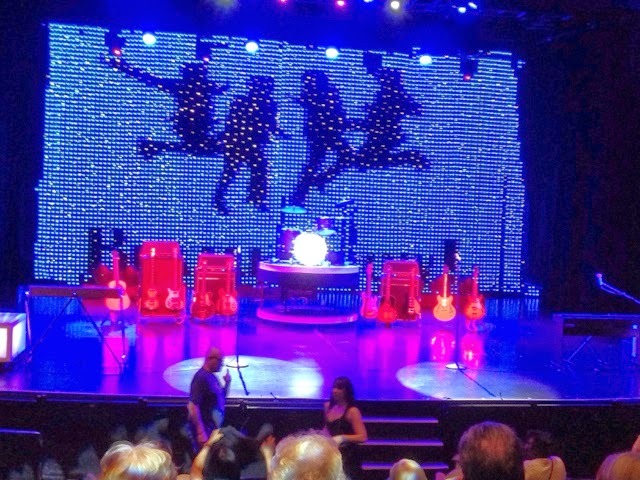 First was the Beatles Tribute Band Show at Saxe Theater in Planet Hollywood at 5:30. We bought discount tickets online at TravelZoo for $15.00 each. The band and it's members was very good and well worth the $15 or $25 for seats closer to the front, but the theater is so small that sitting closer was not necessary. 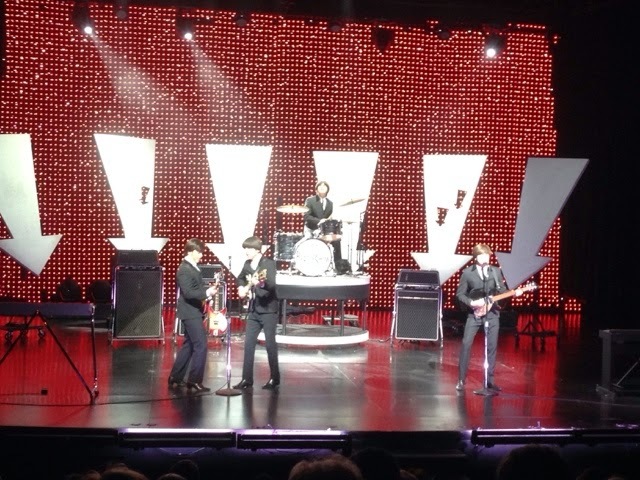 In fact, one song was played next to us at the center isle. 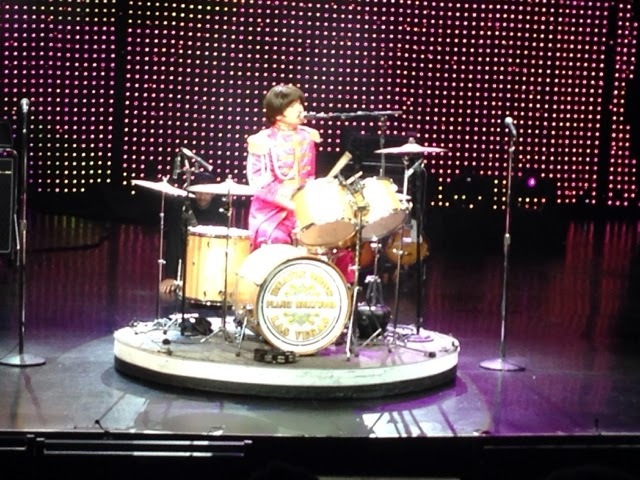 Each member of the band dressed and was in-character and also performed solo songs. We had sufficient time to eat on the strip before heading to the Luxor, that is connected to our hotel the Excalibur. At 9:30 we had tickets to the show Magic Jam that stars Criss Angel, who was injured during one if his magic stunts that damaged his shoulder that required surgery 10 weeks ago. The Magic Jam show comprises a number of magicians who have been put together until Criss Angel is able to perform his Believe show again by himself. These tickets cost $54.00 each and not bad for a high quality show. We bought the tickets from one of the Tickets4Less booths on the strip. 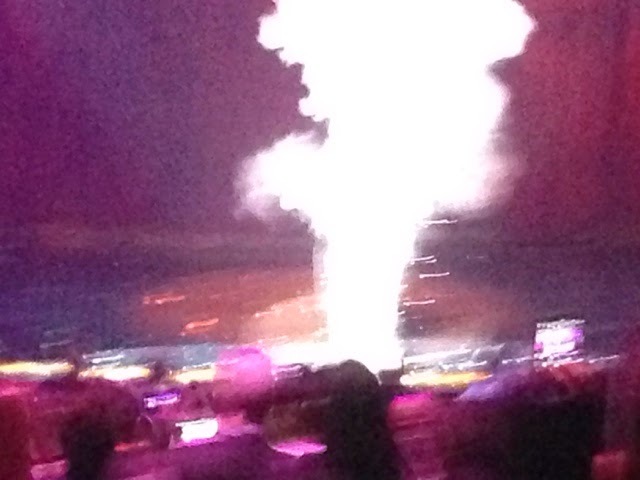 Criss allowed photos of his final act of the night disappearing. With the distance and all the people between me an the stage, the focal distance was not able to auto correct for the photo. That is why it is a bit blurry. After the show and while watching the 11:00 pm news we learned that a man was arrested for causing a disturbance at the Thunder Down Under Show & firing a gun that went into the ceiling causing minor injury to one of the actors. This show is downstairs at our hotel, the Excalibur. We walked through that area on the way back from the Luxor but the situation was all over by the time we came through. Tomorrow we leave Las Vegas early to visit the Hoover Dam before we make our way to The Grand Canyon for the afternoon.